The sensation of life in a private beach front villa, in a tropical paradise is one often sought and now found with this magnificent beach villa. This designer furnished five bedroom villa comprising of four separate pavilions with 354sqm of living area plus 348sqm of outdoor terraces and a private lap pool offering the ultimate in luxury living. With unobstructed views of the beach, azure Gulf waters and the island of Koh Phangan, this living room pavilion is the quintessential beachfront haven. The giant folding windows/doors create a seamless connection to the outdoor living/entertaining areas, BBQ corner as well as the 27m private lap pool with jacuzzi. The interior is sophisticated and comfortable; a contemporary haven to fulfil a tropical holiday dream. This very large kitchen/dining pavilion, which is equipped with the latest technology in appliances with double wall ovens and built in coffee/espresso maker, features two large granite islands for your entertaining/cooking enjoyment. The elegant dining room with a 13 foot vaulted ceiling, is adorned with a contemporary glass table and seating for eight. The entire space is a symphony of comfort, convenience and function. 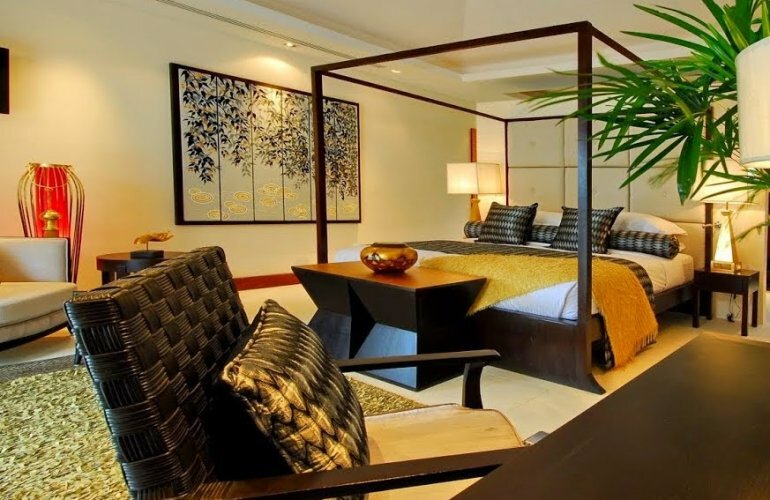 This third pavilion consists of a master bedroom and guest bedroom, both en-suited. The master bedroom is a sanctuary of calm with views through the pavilions to the ocean. Vaulted ceiling, four-poster super king size bed lavished with silk drapes and a comfortable lounging area allow you to absorb the magic of the villa. The master en-suite features an indoor and outdoor bathroom and is the ultimate in spa style living. The wet room containing a granite shower and magnificent soaker tub, with views to the ocean and tropical garden, steps out to the 27 metre lap pool. The guest bedroom is luxury defined! A sensational blend of soft neutral textures, within this private ocean view bedroom. The adjoining en-suite bathroom is a mixture of granite and terrazzo, complete with rain shower. The fourth pavilion is comprised of three self contained suites: two Garden Suites and one Terrace Suite, each with en-suite bathrooms. All rooms are tastefully presented creating an elegant fusion of design, texture, colours and functionality. Opening to either a verandah or terrace, the suites offer outdoor dining/lounging areas and are fully equipped with a convenience centre that includes refrigerator, microwave, coffee machine, toaster, crockery and utensils. The villa and suites are equipped with the finest linen and towelling, flat screen TVs with satellite channels, iPod docking stations in all bedrooms, electronic safes, a local mobile phone, complimentary wireless broadband and private maid service. In addition to the villa's own private pool a 30 meter beachfront pool with ample deck space is accessible to all guests. The Villa can be rented complete as a five bedroom vacation home or optionally as a two-bedroom villa including the Ocean, Dining and Master Pavilions.